Cell separation is an important process that occurs throughout the life cycle of a plant. It enables the radicle to emerge from the germinating seed, vascular tissue to differentiate, sculpturing of leaves and flowers to take place, pollen to be shed from the mature anther, fruit to soften, senescent and non-functional organs to be lost, and seeds to be shed. In addition to its intrinsic scientific interest, many of the developmental processes to which it contributes have importance for agriculture and horticulture. This is the first volume to focus exclusively on these processes and to link improvements in our scientific understanding with methods that may allow us to manipulate cell separation and adhesion to the benefit of the agricultural and horticultural industries. It will therefore be of interest to the experimental scientist and to those who wish to apply these techniques commercially. 1. 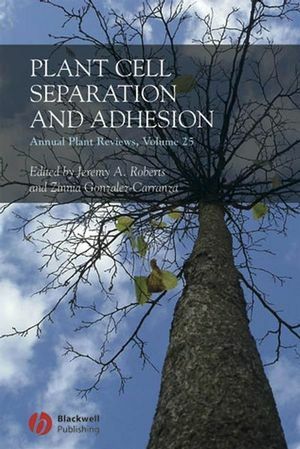 Cell separation and adhesion processes in plants. Jeremy Roberts and Zinnia Gonzalez–Carranza. Plant Sciences Division, School of Biosciences, University of Nottingham, Sutton Bonington Campus, Loughborough, LE12 5RD, UK. 2. Cell wall structure, biosynthesis and assembly. Aaron H. Liepman, David M. Cavalier, Olivier Lerouxel, and Kenneth Keegstra. MSU-DOE Plant Research Lab, Michigan State University, East Lansing, Michigan 48824, USA. 3. Vascular cell differentiation . Hideo Kuriyama and Hiroo Fukuda. 4. Cell adhesion, separation and guidance in compatible plant reproduction. Jean-Claude Mollet, Céline Faugeron and Henri Morvan. Laboratoire de Glycobiologie et Physiologie Végétale, Université d’Artois, Faculté Jean Perrin, SP18 Rue Jean Souvraz, 62307 Lens, France. 5. Cell separation in roots. Fushi Wen, Department of Plant Sciences, Division of Plant Pathology and Microbiology, University of Arizona, Tucson AZ, USA;. Marta Laskowski, Biology Department, Oberlin College, Oberlin OH, USA; and. Martha Hawes, Department of Plant Sciences, Division of Plant Pathology and Microbiology, University of Arizona, Tucson AZ, USA. Michelle E. Leslie, Curriculum in Genetics and Molecular Biology, University of North Carolina, Chapel Hill, NC 27599, USA;. Michael W. Lewis, Department of Biology, University of North Carolina, Chapel Hill, NC 27599, USA; and. Sarah J. Liljegren, Department of Biology and Curriculum in Genetics and Molecular Biology, University of North Carolina, Chapel Hill, NC 27599, USA. Lars Østergaard, Department of Crop Genetics, John Innes Centre, Norwich Research Park, Colney, Norwich, Norfolk. NR4 7UH, UK;. Bernhard Borkhardt and Peter Ulvskov, Biotechnology Group, Danish Institute of Agricultural Sciences, Thorvaldsensvej 40, DK-1871 Frederiskberg, Denmark. Catherine Martel, Department of Plant Biology, Cornell University, Ithaca, NY 14853, USA and Boyce Thompson Institute for Plant Research, Tower Road, Cornell University, Ithaca, NY 14853, USA; and. James Giovannoni, Boyce Thompson Institute for Plant Research, Tower Road, Cornell University, Ithaca, NY 14853, USA and US Department of Agriculture - Agricultural Research Service, Tower Road, Cornell University, Ithaca, NY 14853, USA. 9. The role of polymer cross-linking in intercellular adhesion. Keith W. Waldron, The Division of Food Materials Science, Institute of Food Research, Norwich Research Park, Colney, Norwich, NR4 7UA, UK; and. Christopher T. Brett, Department of Biomedical and Life Sciences, Wolfson Building, University of Glasgow, Glasgow G12 8QQ, UK. "The reviews are well written and provide comprehensive overviews of status of our knowledge on cell separation and adhesion processes."